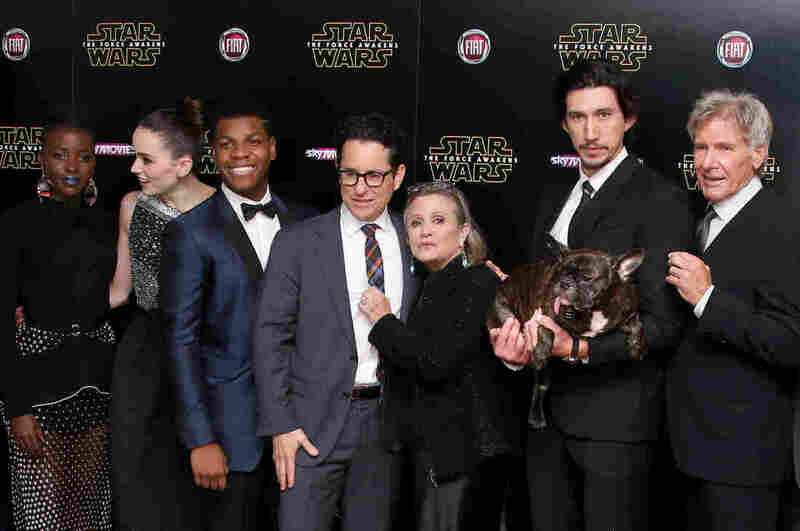 LISTEN: Carrie Fisher, Terry Gross — And Gary The Dog : The Two-Way In an interview with Fisher last month, the Fresh Air host couldn't believe the turn it took when she asked about Fisher's beloved French bulldog. Turns out Gary was right there in the studio. Actress Carrie Fisher, beloved for her iconic role as Princess Leia, died on Tuesday at the age of 60. She leaves behind her daughter, Billie Lourd, her brother, Todd Fisher, her mother, Debbie Reynolds — and her French bulldog, Gary. 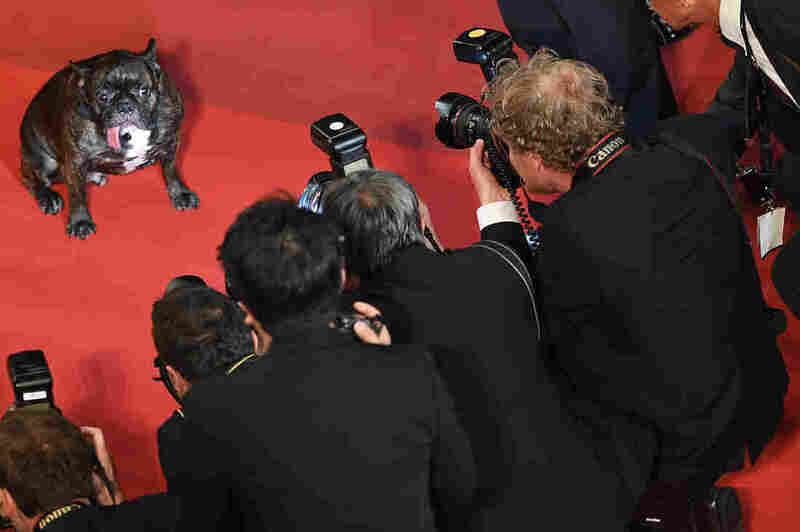 Gary Fisher is a celebrity in his own right — he traveled widely with Fisher and was a star on Instagram and Twitter. And when Carrie Fisher visited NPR's studios in New York City, to talk to Fresh Air host Terry Gross, Gary came along, too. Gross, however, was in Philadelphia. She didn't know there was a dog in our studios. She didn't even know that was allowed. In the conversation that followed, it's impossible to miss the buoyant personalities of both Fishers — Carrie and Gary. GROSS: So I have to ask you about your dog Gary who is now a kind of famous dog, and you use him as your profile picture on Twitter. And he's - what kind of dog is he? FISHER: He is a French bulldog. FISHER: And he's right here in the studio with me. GROSS: Yeah. You get to take him everywhere. It's like — I don't know that they usually let dogs in the NPR studio. You're in the NPR bureau in New York. Is he officially a therapy dog? FISHER: Yeah. I — you know, I didn't get him for that, but he's very soothing to have around. He's licking my hand right now. He's just very nice to have around. GROSS: Oh, my God, I hear him licking your hand (laughter). FISHER: Can you hear him? Oh, my God that is such a loud lick. GROSS: Oh, my God that is such a loud lick (laughter). FISHER: Well, he has a very big tongue. FISHER: Well, at least it's not that wet, but it's a very, very long tongue. GROSS: (Laughter) So did you have him certified as a therapy dog, so you could, like, take him onto planes and things like that? FISHER: Yes. Yes. So he sits with me on the plane. Frequently, he sits in the chair, and I sit on the ground. GROSS: So how did you find him? FISHER: I got him here in New York in the village at a very tragic pet store. FISHER: So he looks like he was from like a puppy mill. He's not — everything is sort of wrong with him. 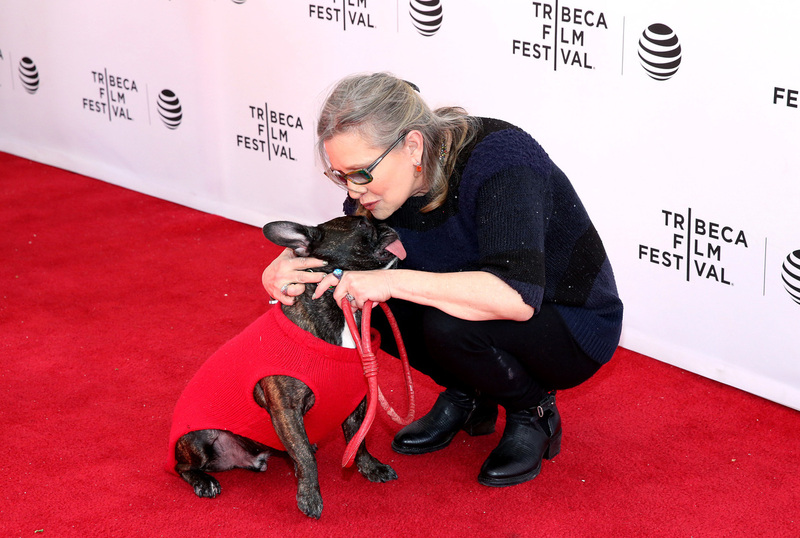 Gary the dog and Carrie Fisher attend Tribeca Tune In: Catastrophe at SVA Theatre 2 in April in New York City. GROSS: (Laughter). So what attracted you to him? FISHER: The tongue. No — I don't even know if the tongue was like that when I first got him. It just gradually got longer and longer and never went into his mouth. GROSS: I can't believe I still hear him licking you. I don't even know if the tongue was like that when I first got him. FISHER: He's still licking me. I'll put my hand up. He's very - he follows me everywhere. He's the most well-behaved dog I've ever had, and I didn't train him. He can give you a high five. He sits. He sits like Winston Churchill. FISHER: He really does. I can't even — you have to see — I'll post a picture of what you'll see. GROSS: (Laughter). All right. Carrie Fisher, thank you so much for talking with us. FISHER: Well, thanks for talking to me. GROSS: And regards to your dog (laughter). Regards to Gary. FISHER: I'll lick him for you.